If you follow me on Instagram, you'll know I chalk painted my fireplace last week. It was something I'd waffled on about doing for months but it took a work visit to Doris & Jeannie on the Belmont Road in Belfast to get me to finally buy the paint. It then took me another month of procrastinating and waiting for the husband and children to be out of the house for a few hours. Because the husband was not keen on the idea. He reckoned it was like something you'd do in a student flat. 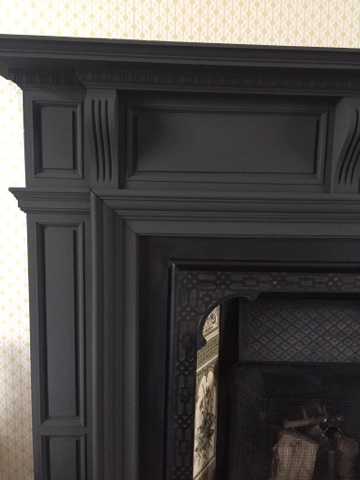 It did make me hesitate I have to say but then I decided I hated the fireplace surround in it's current state so the worst that could happen is that I'd still hate it when it was painted. Here's the before photo...ignore the fender that doesn't fit. It was just to keep all the painting things from rolling off onto the carpet. I'm currently gumtree'ing daily looking a fender that fits. I should say that the fireplace is not original. It was added to the house in the 80's and is not in keeping with the other 1930's original features that have (thankfully) mostly been left alone. It was badly chipped and marked as the house had been let out for about 7 years before we bought it. So overall, it was in a bit of a sorry state. We don't use the room that much and I think it's partly because it's a room that has a slight air of being neglected. So step one is the fireplace....I'll get to the other steps eventually. And here's what I used - Annie Sloan chalk paint in Graphite. I didn't prep the wood at all, apart from giving it a clean with a damp cloth. I used a regular paintbrush (not an Annie Sloan one) and the first coat went on really nicely and without much bother. After an hour and a half of drying, it was ready for the second coat, which was definitely harder to put on. 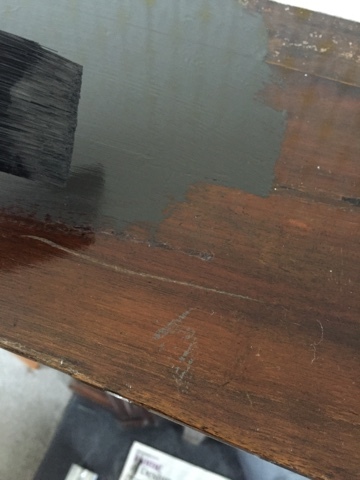 I guess you're painting onto a rough surface and not the smooth original surface? 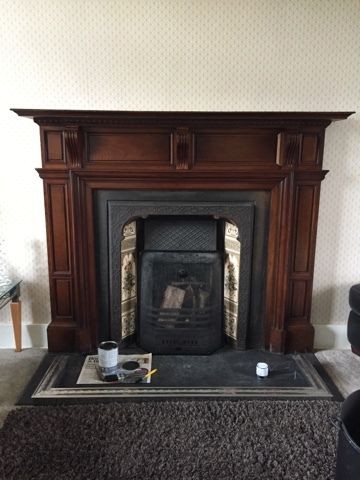 It required much more elbow grease and a bit more care but after about an hour, it was complete and I left the fireplace then to dry overnight. 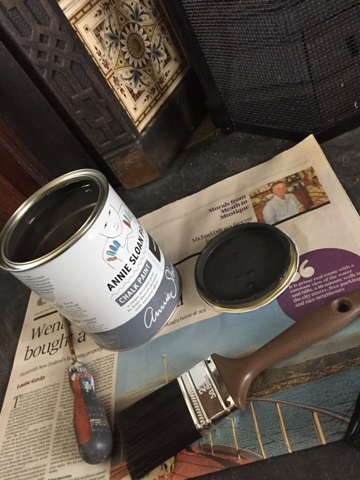 Next morning, I used the Annie Sloan clear wax to coat the chalk paint, as you're advised to do. This is to protect the surface from marking and staining. And here's where I started to throw a strop. It was a MARE to get on. I tried all sorts of cloths and brushes and ended up using an old t-shirt. I must have watched about 8 Youtube videos of happy crafty American bloggers putting it on with apparent ease but I did not find the process easy by any means. It took about 2 hours in total and left me exhausted and with a blister on my hand! But here's the final result. 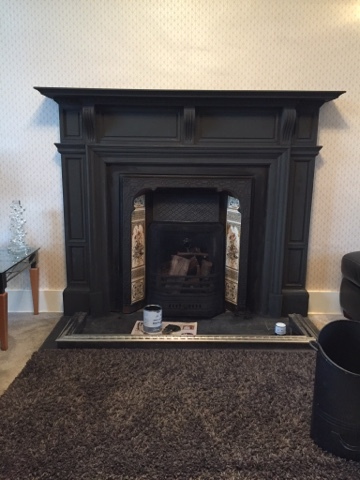 I also cleaned my slate hearth, surround and tiles using oil and a bit more elbow grease. All it needs now is a nice fender, a new rug and the husband to put the mirror back up on the wall. Luckily I'm patient as it's likely to be Christmas 2018 before any of that happens. Would I do it again? Definitely. But not the waxing. Thanks to Helen in Finishing Touches Too in Limavady (another stockist), I found out that you don't have to wax if you don't want to and instead, you can paint on a clear coat of water-based lacquer. Annie Sloan sells this too (on the link). So the next project is the pine furniture in my son's bedroom. Hope you found this helpful - do share any Annie Sloan nuggets of advice in the comments below. You can find your local Annie Sloan stockist on this link. Other chalk paints are available though I've never tried them and there are always lots of workshops locally that will show you the ropes if you're unsure so get googling! I've found the wax pretty easy to apply. I used too much the first time but ended up with a cool liming effect. I used the Annie Sloan brush though and t shirt to wax off. It looks amazing! I've found waxing ok... I use an old muslin or tea towel, a ten pence piece worth of wax and cover an area as big as my hand before getting more wax. The wax should go on pretty easily. After i've covered 3-4 hands worth I wax off with a different cloth, this requires a bit more effort. I love chalk paint! Looks fantastic! That faux-mahogany brown wood was so old-fashioned. Interesting that you can use a varnish instead of wax. I just did some kitchen chairs, and avoided the chalk paint for that reason - didn't want matte or waxy! Yes, I struggled with waxing too and have avoided painting large items again due to that! I made a bit of a mess of a bookshelf with the wax and like you was cursing the second coat of paint. But didn't know you could use Annie Sloan varnish. I have a pine chest of drawers and two bedside tables to tackle.....and may try Autentico paint which I have used for mirror frames and didn't wax. 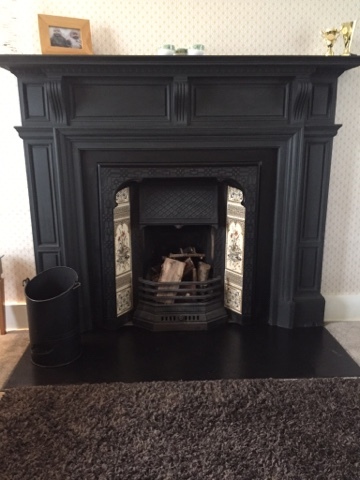 Your fireplace looks great and you have inspired me to get going with the pine painting. Hope your husband likes the fireplace! Wow it ended up looking way better than I expected! I was ready to be devastated that you'd ruined such nice looking wood, but wow it looks awesome. Looks 100% better, nice job! I love chalk paint, and I have to admit I never bother to wax it. I don't like to spoil the velvety depth of the flat chalk finish, and I find it holds up fine without wax. This is probably a dreadful sin to wax paint experts, but it works for me!